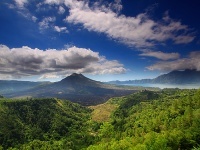 The still-active Gunung Batur volcano is known as Bali's second holiest mountain and symbolises the female element of the island. The male element is symbolized in Gunung Agung, a neighbouring smaller volcano. The walk up Mount Batur is not easy, but the views are spectacular and if you're lucky you might even spot a few monkeys along the way. Gunung Batur rises from a volcanic crater which also contains a lake and the view of this otherworldly landscape from the crater rim is spectacular. Look out for the remanants of black lava flows on the western side of the mountain from this vantage. There is also a great lookout point for those who'd rather hire a car and drive to the old crater rim overlooking Lake Batur. The sunrise walks are recommended, and remain the best way to avoid hiking during Bali's infamous year-round heat. Unfortunately, those visiting during the rainy season may be unlucky with the views as visibility is often poor. There is a guide hut situated at the bottom of the path and passing by usually attracts a mob of eager locals who insist on your taking one of them along for safety. If you want a guide, then this arrangement is convenient, however the hut can be avoided by taking alternative paths. It is safe to ascend on your own, but caution is always advised for less experienced hikers.